Bekele Woyecha is a 2018 Churchill Fellow. This blog complies the experience of Bekele as a Churchill Fellow. What does it take to be a Churchill Fellow? How did Bekele make it this far? How was he inspired? What is his project? What is his plan both short and long term. Where does he want to go from here? The blog will bring all together. As someone who enjoys travelling on a train in the United Kingdom, I thought I could easily travel similarly across Canada. That was only a dream in a country as big as Canada is. In fact, I even sought travel advice from colleagues at the Immigration, Refugee and Citizenship Canada office and asked how easily I could jump from train to train whilst travelling from East to the West of Canada. It was good of them to advise me on time so that I could organise my travels in the best possible way – flying more than 5 times across 4-time zones. One thing for sure, Canada is big; it also has many bighearted people. Jim was right and I can testify that he has done an amazing work to save the lives of many and transform their lives. One of the newcomers sponsored by Jim in 2017 is a Syrian called Firas, who now drives Uber. 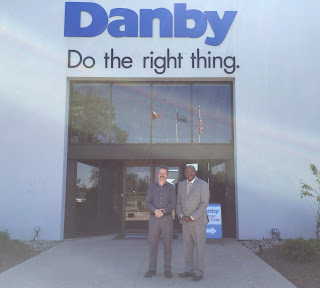 I and my colleague Jonathan had a lucky encounter with Firas as he picked us from our hotel and took us to Danby Office. As soon as we were in his car, we started to chat. Firas was so friendly and started to chat with us and he mentioned that he was sponsored by Jim last year and that he has been studying English, working and now driving Uber thanks to the support from Jim. Firas didn’t stop there. He said, “My wife never spoke English when she came to Canada. She is now at level 6. All because of Jim’s encouragement”. This was so heart-warming. 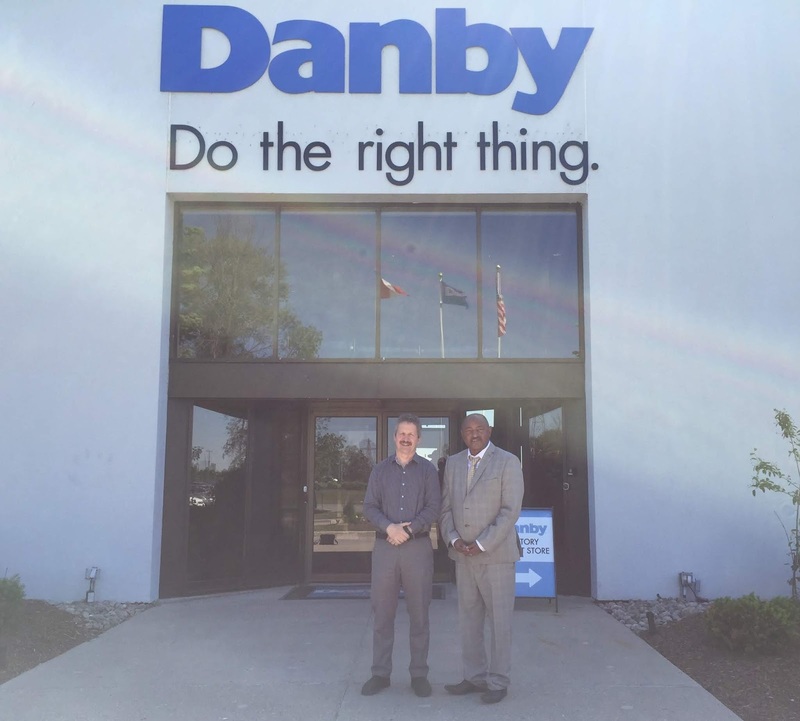 For Jim Estill and his company Danby Appliances - it is all about doing the right thing. Yes doing the right thing at the right time! Guelph might not be as big as Toronto or other big cities, but it is globally known for its refugee sponsorship. That is mostly attributed to Jim and his team. Lucky me to have met Jim and other great people like Linda whilst in Guelph. The Churchill fellowship travels continue. Next stop, Windsor! The wait is over; Churchill Fellowship travel has started. I have been waiting for my travel to Canada for quite a while. Planning diaries, organising meetings, researching where to stay whilst in Canada, how to travel around in this big country, planning fall-back positions in case things go as not planned. Sometimes an email or emails were not enough. Needed to pick up that phone to firm meetings and get better deals. Yes, it was all to travel and meet folks of different experiences, expertise and stories about the Refugee Sponsorship in Canada. What made the scheme a success? Why are those ranging from a small group to big law firms, schools, universities, faith institutions and companies get involved in this? What keeps some of those involved in this for decades motivated? Why them? From Toronto to Guelph, Windsor to Ottawa, Winnipeg to Calgary and Vancouver there are lots of stories to hear and share in the long run. It all started on June 5. Finally, the long-awaited day arrived and I was at Gatwick Airport early in the morning. To make things even more exciting, I was joined by my colleague Jonathan Cox, Deputy Director of Citizens UK, who was travelling to Canada as a speaker at the International Refugee Rights Conference, where I would take part as a Churchill Fellow. Great coincidence! The journey to Toronto was long, but I had lots of energy to cope with as I was excited and have been waiting for this day for months. Once I arrived there, it didn’t take me long to find my ways and adjust to situations in Toronto, which undoubtedly is an international city. Meeting with Deborah Littman, a veteran community organiser was in the agenda. Stories of organising from London to Vancouver and Toronto - ordinary citizens doing extraordinary things. The stories were simply fascinating. In organising, there is nothing called small win. A win is a win. A win can happen only when we sit around the table for negotiations with those who have power. That is what Deborah and her fellow colleagues do. Organise to build power and negotiate to win. The second on the agenda was meeting with Louis Century of Goldblatt Partners LLP based in Downtown Toronto. This is one of the most inspirational meetings I have had so far. The law firm was able to sponsor a Syrian family and resettle them in Toronto. One of the questions I raise to Louis was, ‘why should businesses engage in refugee sponsorship?’. The answer was:- “Refugee Sponsorship gives businesses opportunity to show leadership and can bring sense of pride within the organisation”. Very powerful message. The Churchill Fellowship travel continues across Canada. Lots of heart moving stories to share in the coming days and weeks. Once thing for sure, Canada is a truly welcoming country. That is what I have seen be in a big city like Toronto or small town like Arborg in Manitoba. Even more inspired. All happens because of the Churchill Fellowship. Kudos to all! The above quote means a lot for me. I first applied for the Churchill Fellowship in 2014 and was not even invited for interview. I thought I would give it sometime and comeback. That was what happened in 2017. I remember getting an email from one of the most successful Churchill Fellows, Citizens UK’s Executive Director, Neil Jameson encouraging staff to apply. His encouragement was echoed by my ex-colleague and former Churchill fellow Imogen Moore and Zrinka Bralo of Migrants Organise who is a seasoned civic leader with extensive links with Citizens UK and of course a former Churchill fellow. All the three mentioned that the fellowship was one of the most useful things they did and encouraged us to apply. I kept the emails flagged and took time before I applied. I thus decided to put in application but I wanted to make sure that I gave it my best so that I would succeed this time around. Hence, I spent a few evenings doing a research and being clear on what I wanted to do. Once I submitted my application, I wanted to switch off, but I kept thinking about it. I thought I had done my bit to get the fellowship and if I didn’t get it, it would have meant that there were better candidates. Luckily, I got the email I was eagerly waiting for. Yes, I was shortlisted for interview. Loved it, but I was cautious and not celebratory. In life we don’t always win as we don’t always lose. Hence, I had to prepare for the interview and be once again clear with what I want to achieve if offered the opportunity. Now that I am a Churchill Fellow I will travel to Canada, one of the most welcoming and beautiful countries in the world, to study about its refugee sponsorship program, especially to see how businesses and schools are engaged in sponsorship. Hence I am revisiting my plans and planning my next steps meticulously. I feel privileged to know many people who can help me organise meetings or connect me with those I am keen to meet in Canada. As a Churchill fellow, I aim high and aspire to meet some prominent figures and I very much hope I will be able to meet some of these amazing people and some good old friends. I still recall that very email from Neil and subsequent emails from Zrinka and Imogen. They were fellows that pushed boundaries. They were also folks who showed many of us why Churchill fellowship was a good thing. They travelled to learn and came back and inspired us. Yes, I say us as there are two of us from Citizens UK as 2018 fellows. My good colleague Amanda Walters is also a fellow this year as we keep the connection of Churchill fellowship and Citizens UK alive. The most inspirational Neil Jameson was a 1977 fellow who travelled to the US. Of the back of that great opportunity, Neil founded Citizens UK. That great opportunity Neil had and his tenacity to make a difference meant we have a strong guild of Community organisers, who are all striving to make a difference. I am a Churchill fellow now because my organising career helped me to build my confidence; it helped me to challenge established norms and see the world from different angles. Now that I am a Churchill fellow I am determined to be even more ambitious and get the best out of it. I very much hope this great opportunity, of course a once in a life time opportunity, will be useful for me, the communities I am working with and the wider public. It will also be an opportunity for me to share about my experiences in the UK. I am ready to travel, learn and share; come back to share and inspire others to act. Churchill fellowship, an opportunity of a lifetime! I was born and raised in Addis Ababa, Ethiopia; a country dubbed to be the cradle of mankind. I live in London, one of the greatest and cosmopolitan cities in the world. I see the world in London. I have seen beautiful cities in Africa, Europe and America. In love with this diverse world of ours. Professional wise, I enjoy my Community Organising job in the United Kingdom. This rewarding job brings me in touch with people from across the globe who relentlessly work hard to change the world from ‘as it is’ to ‘as it should be’. I am concerned about the current refugee crisis. Many people across the world are persecuted for their religion, race, political belief, sexual orientation and other reasons and forced to leave their homes in search for homes and safety. It is disheartening to see fellow humans denied the right to a decent life. Hence I work with others to welcome refugees. I hate it when some abuse others using their POWER, organised money and organised people. I hate it when leaders cling onto power by force It is down to my generation to identify, train and coach the next generation of leaders and empower them with hope and love. Tomorrow should be a better day!